We believe that positive youth development and quality education go hand in hand. Which is why since 2006, the TGR Learning Lab has strived to not only offer students unique learning experiences in STEM and enrichment programs in college access, but also serve as an environment where kids can recognize their potential and create positive change for themselves, their families and their communities. At the TGR Learning Lab, we’ve completely transformed the average school day. Each week, our 35,000-square-foot learning lab opens its doors to fifth graders and their classroom teachers from across Southern California. What awaits students and teachers both is an exciting week of immersive, hands-on STEM learning. Whether students participate in our Forensic Science or Marine Science classes, one thing is certain—we don’t teach from a textbook. Our award-winning program with lessons designed in-house by our team of dynamic learning facilitators, encourages students to learn through interaction and engagement. Within the Forensic Science class, our junior crime solvers learn real-world techniques, including fingerprinting, DNA analysis and chromatography. The budding biologists enrolled in our Marine Science class take a deep dive to the bottom of the sea to explore oceanic regions, get their hands dirty with a squid dissection, analyze sand samples and learn about marine-life classifications. But it’s not just the students who receive a week of experiential learning—their classroom teachers also benefit from our unique STEM professional development program.This week-long training equips teachers with a new arsenal of standards-aligned, grade-specific STEM lessons that can be implemented in their own classrooms. Implementing two key strategies, the TGR Learning Lab offers expanded learning programs to unleash the full capacity of underserved middle and high school students. First, we strive to foster a growth mindset within every student that walks through our doors. Our top priority is to build strong relationships with our kids, encouraging them to challenge themselves and build self-confidence. It is our philosophy that the path to greatness begins when students believe in their own ability to succeed. Second, we connect school and career, preparing students for today’s jobs and the ones that don’t exist yet. With over 50 areas of study within STEM-related fields, our classes offer students hands-on learning experiences, allowing them to recognize their potential and identify their interests with a future career in mind. Utilizing state-of-the-art technology and project-based learning, students take classes in a variety of disciplines, including: video game design, coding, rocketry, robotics, civil engineering, urban planning and wearable electronics. To help students gain information on post-secondary educational options, we provide over 30 college-access and financial aid workshops annually. By offering students experiences that far surpass what is offered in a traditional classroom setting, we strive to provide them with tools for success while cultivating their aspirations for higher education and a career. Our expanded learning opportunities span across the nation, with satellite programs in Washington, D.C., South Florida, Philadelphia, New York, MCB Quantico and our flagship location in Southern California. Our after-school programs are open to students throughout Southern California, Monday–Thursday from 2–6 p.m. Additionally, acceptance is based on student report card and personal statement. It’s never too early to start thinking about college—and for the first-generation student, the college search and application process can be especially overwhelming. Our college-access program provides workshops, group sessions and presentations on topics ranging from writing a personal statement and making a college list to understanding financial aid and finding scholarships, designed to help all students, especially low-income and first-generation students, plan a roadmap to college. Our college recruitment events bring dozens of universities to the TGR Learning Lab, allowing students to meet face-to-face with college representatives. Reaching students and families across the nation, our college-access programming can be found in communities within Washington, D.C., New York, South Florida, MCB Quantico and Southern California. We believe that students can and should learn every day—summer is no exception. Without the structure of the school day, it’s easy for kids to lose motivation and momentum. This is why the TGR Learning Lab continues to offer interactive, career-focused experiences within STEM fields during those critical summer months. Our summer programs are open to students throughout Southern California. During selected weeks we offer classes from 9 a.m.–12 p.m. for rising 5th and 6th grade students and 1–4 p.m. for rising 7th through 12th grade students. Summer classes run Monday through Friday. Acceptance is based on a first-come, first-served basis. Summer Applications deadline is June 1, 2018. Click below to download the application. Questions about our summer programs? Email us. The golf program at the TGR Learning Lab is designed to promote golf to underserved youth, provide golf-course access, and expose kids to careers in the golf industry. Students gain an understanding of the biomechanical motions of golf swings and kinesthetic movements during a swing, as well as course-management strategies to lower scores. Working with top-notch instructors, students build self-confidence while learning the game in a safe, supportive environment. Golf programs are offered year-round for students of all skill levels. Additionally, our Player Development Program builds honesty, integrity, and sportsmanship while honing golf knowledge and skills. We take student golfers through three levels of the program: Level 1-Tour Class, Level 2-Players Class, and Level 3-Masters Class. Each level contains progressive milestones for students to reach. Identical twin sisters and Stanford University students Erica and Jessica Rivera have been shaped by their family's struggles, but they refuse to be defined by them. Their grit and unstoppable drive to succeed embody the spirit of our scholars. From as early as fourth grade, Erica and Jessica Rivera remember the joy they felt solving math problems in class—the joy of finding a solution to every problem that came their way. Looking for solutions to life's problems is something they have had their fair share of. Their single mother immigrated from Mexico with little more than a fifth-grade education. As high school students, Erica and Jessica were up by 4 a.m. most weekends, helping their mother load a truck with clothes and shoes to sell at the local swap meet to make ends meet. Growing up, the family of three shared a single bedroom in an apartment in one of Anaheim's most dangerous neighborhoods. The TGR Learning Lab became an educational refuge for the girls. While they were first introduced to the learning lab during their elementary school's week-long field trip in fifth grade, it wasn't until the twins were freshmen at Anaheim's Savanna High School that the lab became part of their daily routine. They came in to study for exams, receive help on homework and take part in STEM and college-access after-school classes, like food science, photography and their favorite, College Bound Academy. We’ve made great strides helping young people and their communities, but we can always do more. Quality educational resources transform students and their schools. 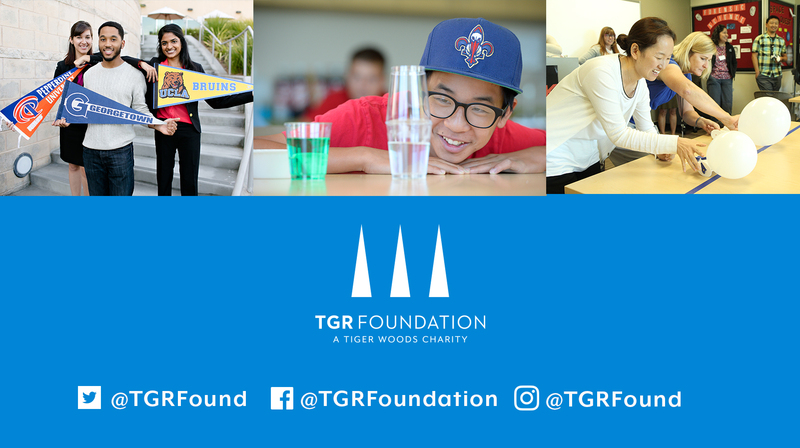 Join Tiger to invest in programs that empower low-income youth to thrive in school, their communities and the working world.